We offer you powerful contract modeling calculators, accurate contract management and reporting features. Full RMReimbursement Maximizer suite with all modules and self model all payer contracts. Self modeling all payer contracts and subscribing to our contract modeling and reporting module for a lower price. Full RMReimbursement Maximizer suite with all modules, plus we model all your contracts for you, maintain and update them and provide valuable reporting. We model all your contracts for you, maintain and update them and you can subscribe to our reporting module only for a lower price. We model all your contracts (or give you the option to self model all your contracts), taking into account carve-out items such as high-cost drugs, devices, ancillaries, as well as first and second day stop loss, MS-DRG/APR-DRG, APC, and ALL inpatient and outpatient contract rates. 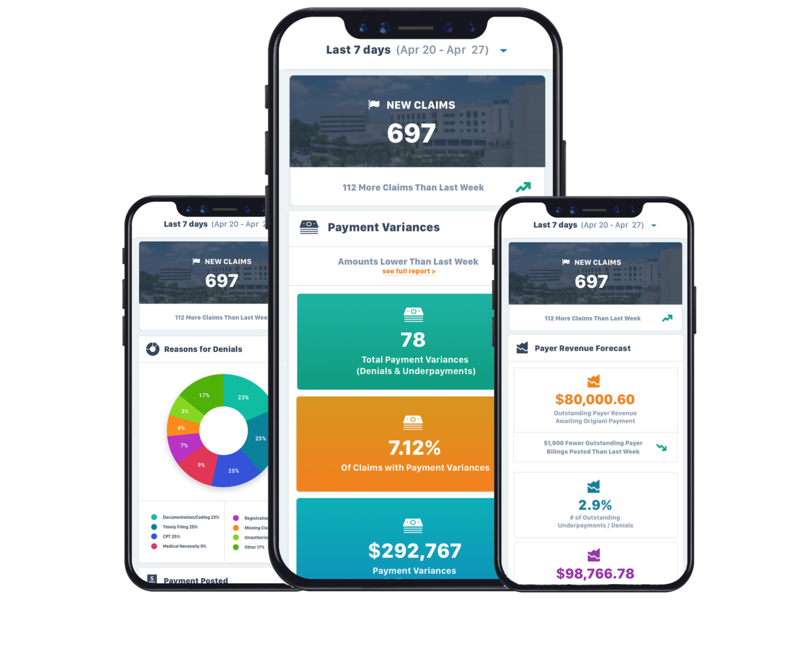 Our system pre-calculates the expected plan allowable with our customized payer contract calculators and compares that amount to the payment processed by the payer. We provide you a report with a detailed analysis of payer activity, source reasons for underpayments and denials, and recommendations to stop future cash loss. You can generate your own custom reports to use over and over again, or use reports from your reports library (over 30 industry standard reports). 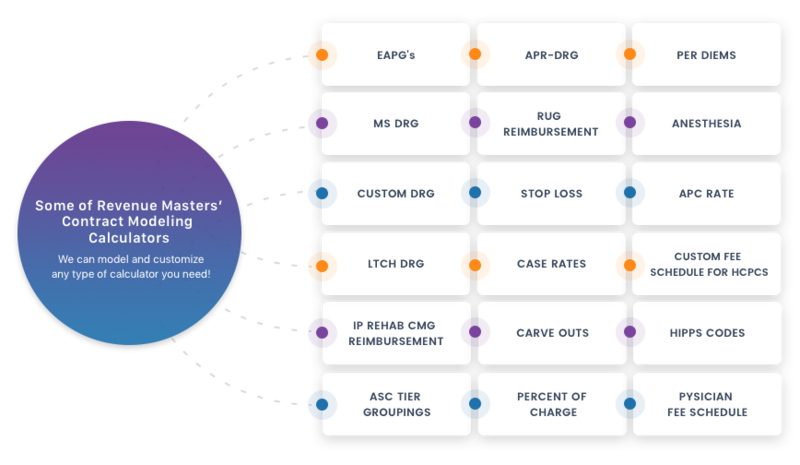 You start increasing your net patient revenue by overturning denials and underpayments easier with our powerful contract modeling and reporting tools. Our modern reporting and dashboard tools provide greater access, visibility, and context to payer payment performance. With our reporting module, 100% collections is now possible. ‌Expected Payment vs. Actual Payment Received. Calculates the plan benefit expected contractual and allowable for all payers. ‌Alerts for contract expirations. To make you aware of the short-pay and delayed payments and help you keep track and give priority to the accounts that need it. ‌Automatic identification of all no-pay and short-pay claims. You can see how the claim should be paid, including a time frame and overall charges, accelerating realization of expected business value. This allows early detection of denials and underpayments and higher possibility of collections. Whether you decide to self model you contracts or have Revenue Masters model them for you, we will provide you with a daily write-down report, along with the audit note showing how each claims’ allowable was calculated to assist with detecting not only denials but underpayments as well. Contact us today to learn how you can achieve 100% collections. Free RCM Demo - Take a quick look at some of our reporting features. See how CFO's always know their Collected vs. Collectable. Download Revenue Masters CvC Demo App.